Virtual-reality technology can open a new frontier in job training. In these contentious times, perhaps it’s heartening that Ivanka Trump and Silicon Valley’s potentates have at least one thing in common: concern for the future of America’s workforce. As the White House point person on a new jobs initiative, Trump wrote in a recent op-ed that it’s high time “to deliver better workforce training.” That’s where Silicon Valley comes in. We’re overdue for something revolutionary to ameliorate “unfair” outcomes from technological and economic disruptions to the workforce. For too long, we’ve met every cycle of technological dislocation with the same unimaginative policies: financial aid and PR for vocational schools and community colleges, retraining grants, corporate pledges and private-public “partnerships,” or just old-fashioned welfare. The big problem is that there are far more openings for skilled employment than there are people with the requisite skills to fill them. Contrary to received opinion, technology is not eliminating work so much as it is changing the skills landscape. And there won’t be enough robots to do those skilled jobs for years—if ever. President Trump’s new White House National Council for the American Worker proposes to “facilitate the use of data to connect American businesses, workers and educational institutions.” At the White House initiative last week, 15 major corporations pledged to hire and train workers. All this constitutes a necessary, but far from sufficient, step. The missing ingredient is a revolution in skills training. Up until now, the best that the Internet could do was enable online learning for job functions like accounting or coding. But that’s a cakewalk compared with mastering welding, plumbing, or machine repair/maintenance online. Fortunately, technology is opening a path to superior skills training via realistic virtual simulators that can be accessed remotely. Remarkably realistic virtual reality (VR) environments are now available in medical and military applications. Microsoft’s HoloLens may be the most sophisticated VR simulator so far, presenting realistic life-size simulacra of human organs for doctors to practice surgery and simulated rescue operations for soldiers. It’s still too expensive for everyday use, and truly immersive verisimilitude remains over the horizon. But near-perfect visual, tactile, and other sensory inputs will soon emerge. 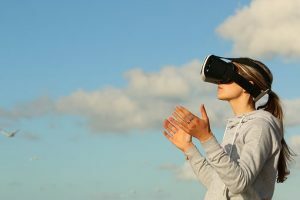 AI, virtual and augmented reality, and high-speed network connectivity to supercomputing in the Cloud are merging with the budding revolution in sensors and materials to enable “haptics” that allow a sense of touch and the reality of a “tactile Internet.” The latter will be key to skills training. It’s time to emulate Edwin Link, who introduced the first aircraft simulator in 1929. Flight simulators revolutionized the skilled trade of flying. While hands-on training remains essential, the simulator accelerates the acquisition and refinement of the aviator’s skill set. Creating VR training systems is squarely in the Silicon Valley wheelhouse; skills-centric VR won’t be easy or cheap, but Silicon Valley’s disruptors can afford it, and they should volunteer to fund it. Developing sophisticated virtual training systems would be far less expensive—and more productive—than imposing new taxes to fund welfare programs like universal basic income. And retraining people is self-evidently more moral than assuming that they should be put out to pasture, with a stipend. As both history and current trends show, advances in technology mean that fewer people end up working per unit of good produced or service created. But increasing productivity is the point of new technology and has been the engine of prosperity over millennia—and it has always meant more net new jobs. Technological innovation does tend to alter the nature of work and the kind of skills required, though, leading to job losses for an unlucky minority. Today, as in the past, most Republicans and Democrats believe that we should do something to smooth out the technological dislocations thrust on that minority. As always, the devil is in the details of what constitutes “something.” Nearly two centuries ago, we saw a revolution in the means of production. A half-century ago, the first commercial computers triggered a revolution in the means of management. Now we’re on the cusp of a revolution in the means of job training. It’s time for Silicon Valley to step up. BARRYSTAFFis looking for someone to work for a company in Dayton thatprovides blower shafts to a variety of manufacturers throughout the US. Must have a pair of leather work boots you can wear. Must also have high school diploma (or GED), a good work history and clean background. BARRYSTAFF is working with a company seeking an analyst for lab work. This person will work with water samples maintain log books and record keeping in accordance with lab policies. Minimum of a 2-year degree in a science-related field. Must have lab experience working in the fields of biology and/or chemistry. BARRYSTAFF is looking for assemblers to work at a production facility in Dayton. Operations include, but are not limited to: planting, insulating, gauging and marking taps, tapping, potting, welding, coil and coil assembly testing and more.